Our Fall Geology Department field trip set out from Williamsburg to central Virginia, and the James River for a geological float trip down the river. 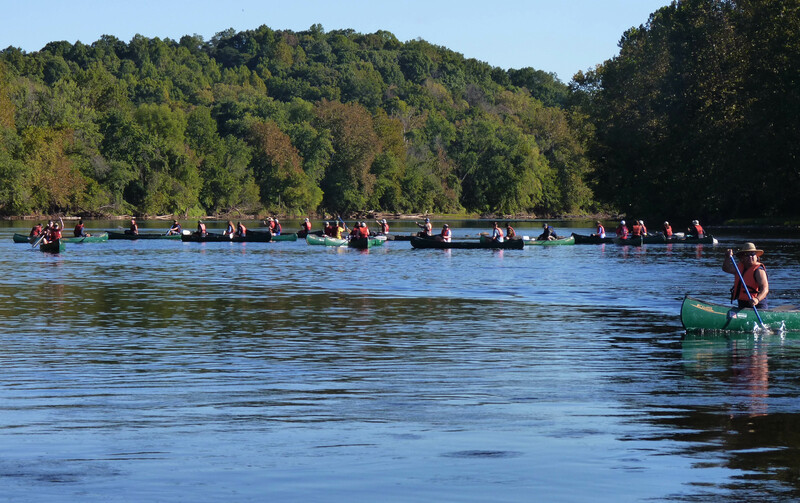 The autumn weather was close to perfect, and our crew of 30+ students were ready for a fluvial adventure. We camped at Hatton Ferry, pitching our tents on a patch of flat ground adjacent to the James River. On Saturday morning, after breakfast as the fog was clearing, we discussed the origin of that flat ground. We were on the James River’s floodplain, it’s underlain by alluvium (primarily a silty-sand) that was deposited by the James during floods when the river exceeded its bankfull discharge and covered the floodplain with sediment laden waters. 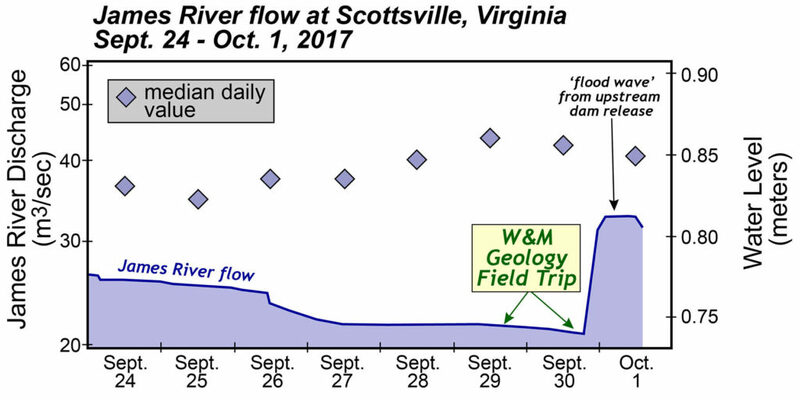 During our trip, the James was flowing low and clear with the discharge, as recorded on the U.S. Geological Survey’s Scottsville gauge, at ~22 cubic meters per second (~750 cubic feet per second). The river was running low for this time of year, as the median daily value for late September should be closer to 40 m3/sec (1,400 ft3/sec). 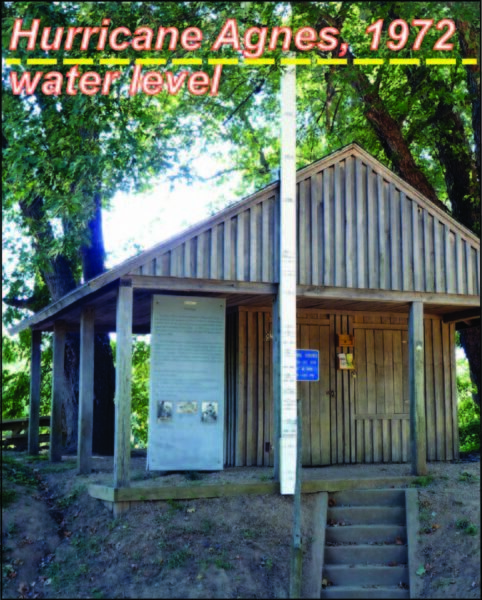 Data from the U.S. Geological Survey’s gauging station at Scottsville, Virginia – ~5 km downstream from Hatton Ferry. Just hours after we departed the James, its water rose due to the arrival of a ‘flood wave’ from a scheduled water release at a dam in the Allegheny Mountains. At Hatton Ferry there is a long staff with the dates of high water events clearly marked. In 1972, precipitation from the remnants of Hurricane Agnes brought the James River’s waters up to the highest level ever recorded in central Virginia – it was an epic flood. The peak flow during Agnes was nearly 6 meters (20’) higher than our campsite, and 9 meters (~28’) higher than the river was flowing during our field trip. The floodplain is a fine camping spot during low-flow conditions. Wooden staff at Hatton Ferry denoting the high water mark from past floods. To gain a better understanding of flood frequency geologists commonly rank the peak flow event that occurred during any given year relative to other years. 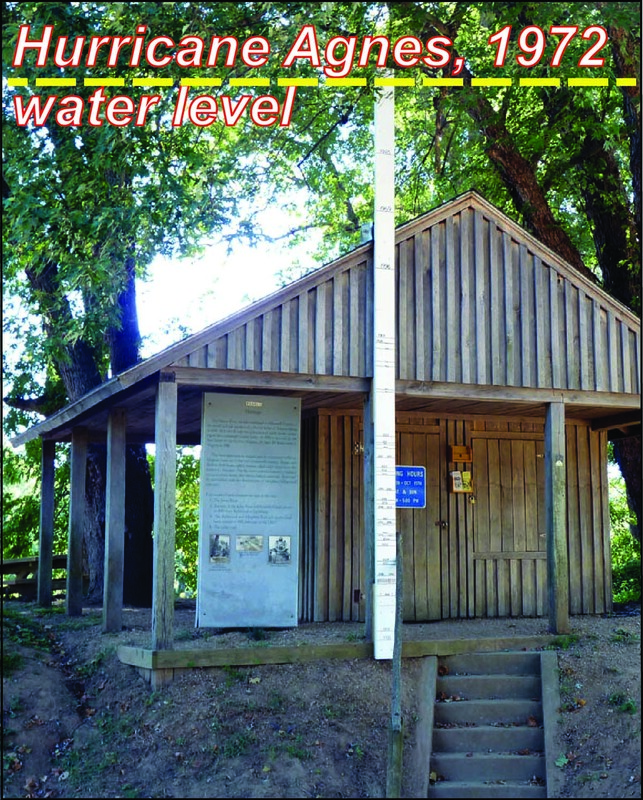 The 1972 event was the largest (highest water level) measured in the past 92 years at the Scottsville gauge. The 2nd largest event took place in 1986 (actually it was the late Fall of 1985, but the U.S. Geological Survey’s ‘water year’ is October through September), and the 3rd largest event occurred in 1969 after Hurricane Camille. The peak flow for 2017 reached 1,400 m3/sec, enough to rank as the 61st highest peak annual flow. So for an event of Hurricane Agnes’ size its recurrence interval is (92 years +1)/1 = 93 years. The 1986 event has a recurrence interval of 46.5 years as two events of that size or greater occurred during the 92-year time interval. The 1969 event has a recurrence interval of 31 years with 3 events of that size or greater during the 92-year time interval. The lowly 2017 peak flow event has a recurrence interval of 1.5 years. It is important to be clear about a few things regarding flood recurrence intervals. The longer the time series the better – at the moment, the 1972 Agnes flood is considered to be the 93-year flood, but if it remains the largest measured flow for the next 7 years it’ll become a 100-year flood. The 1969 flood from Hurricane Camille has a recurrence interval of 31 years, however that does not imply that another flood of the same magnitude will not occur for another 31 years. Just three years later, the larger Agnes flood took place. It’s worthwhile to think of the yearly probability for a flood of a particular size occurring. A 100-year flood has a one in 100 chance (1%) of occurring in any given year, whereas a 20-year flood has 5% chance of occurring in any given year, and we’d expect a 50% chance of a 2-year flood occurring in any given year. How frequently does the floodplain, upon which we had just spent the night, get flooded? 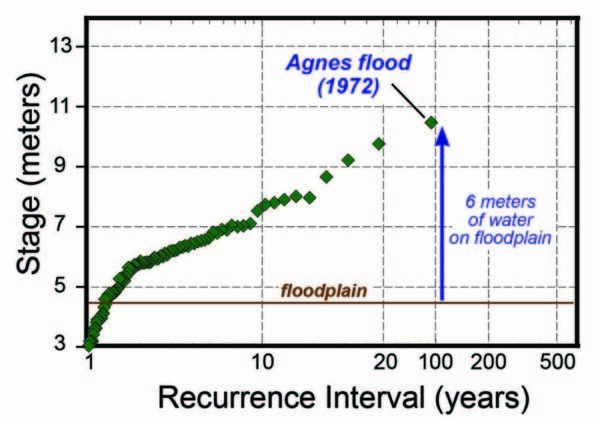 We can estimate that by plotting the recurrence interval and the flood height or stage. As you’d expect, bigger floods (with higher water levels and a larger recurrence interval) occur less frequently than small floods. The flood produced during Hurricane Agnes reached 10.5 meters on the Scottsville gauge, and covered the James River floodplain with ~6 meters of water, so we can work back from the Agnes flood height. To just reach onto the floodplain, the James River has to rise to a stage of at least 4.5 meters, and it’s reached or exceeded that height 74 times during the past 92 years. Put another way a flood of that size ranks 74th with a recurrence interval of 1.26 years. The floodplain does not necessarily flood every year, but on average in 8 years out of 10 years the James River’s waters exceeds bank full discharge. 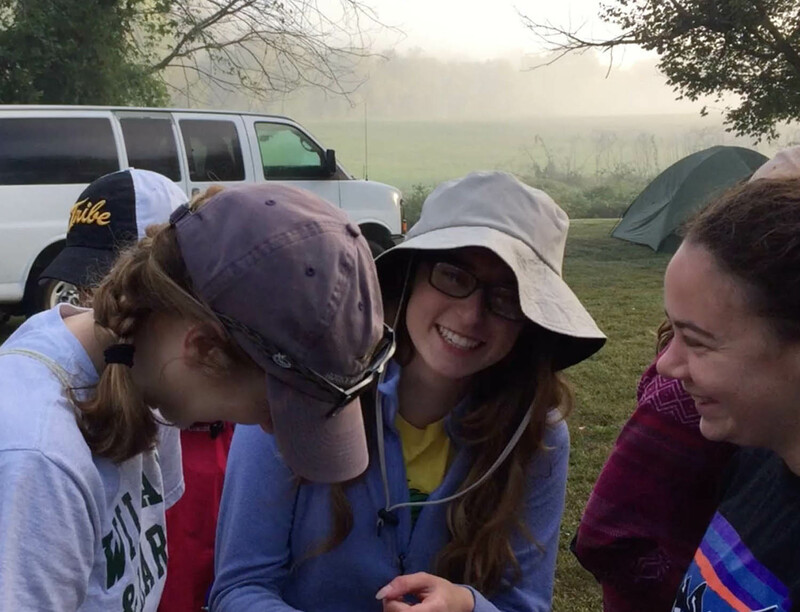 William & Mary geologists (from left to right) Joanne Ensley ’19, Eve Pugsley ’18, and Leah Marshall ’19 discuss floodplains and flood frequency as the fog clears. Our 20-minute bus ride to the put-in location at Howardsville included a rousing geological rendition of the timeless classic “the wheels on the bus go round and round”. The day was off to a good start. By 9:30 a.m. we were afloat upon the James River. The W&M Geology flotilla afloat on the James River. 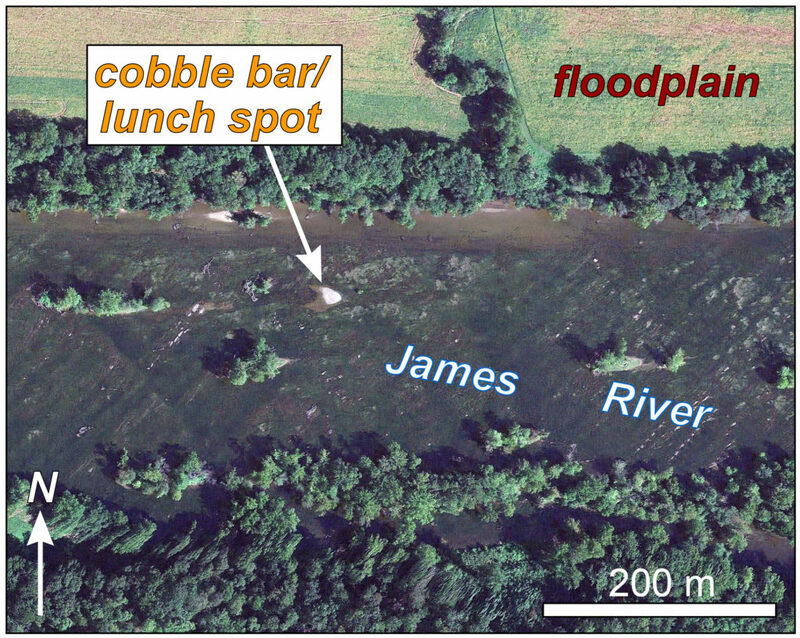 We examined outcrops that were well exposed because of the low-flow in the James River. During the trip we visited outcrops of the 3 rock types – igneous, sedimentary, and metamorphic, which makes for a balanced geological diet! Rocks exposed in the James River between Howardsville and Hatton Ferry, Virginia. On the Alligator, a curiously shaped outcrop in the James River that exposes Triassic conglomerate. We lunched on a cobble bar in the middle of the river. At low water it was a perfect location for taking our mid-day break, measuring the conductivity and pH of the river waters, and discussing the provenance of the rounded cobbles that compose the bar. Imagery of the James River in southern Albemarle County, Virginia. Bedrock outcrops and alluvial islands are visible in the channel of the James. There was also time for birthday cake, as we celebrated geology major Moussa Dia ’18 21st birthday in fine style. 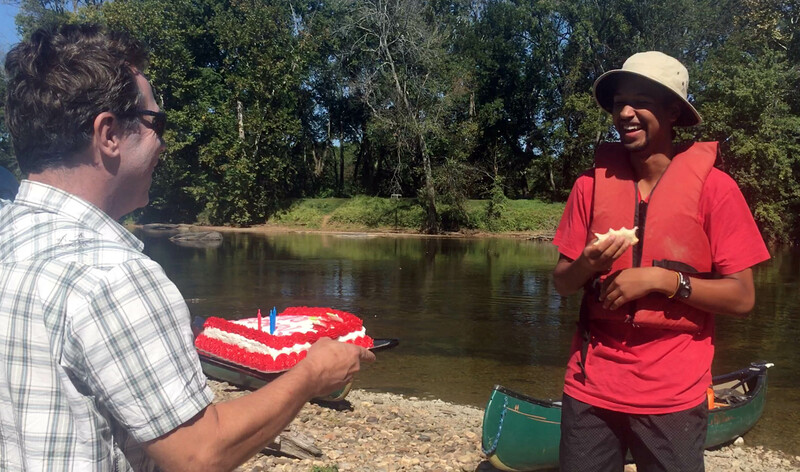 Moussa Dia and his birthday cake on a cobble bar in the James River. 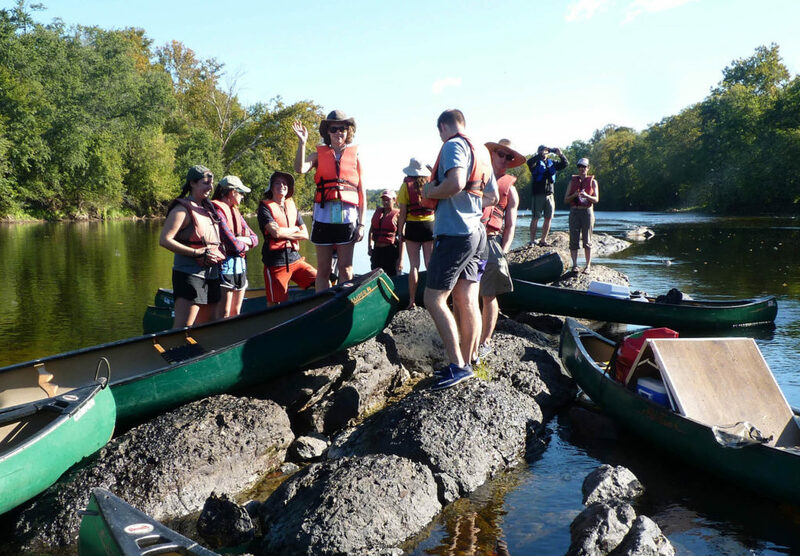 Trouble lurked downstream, as the intrepid William & Mary geologists had a few sets of Class II rapids to traverse. 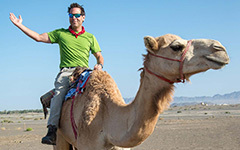 It was an adventure For the Bold, and a story best left for another blog post!